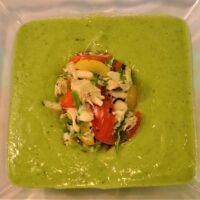 This a play off a dish that was very popular at a restaurant I owned on Long Island years ago. 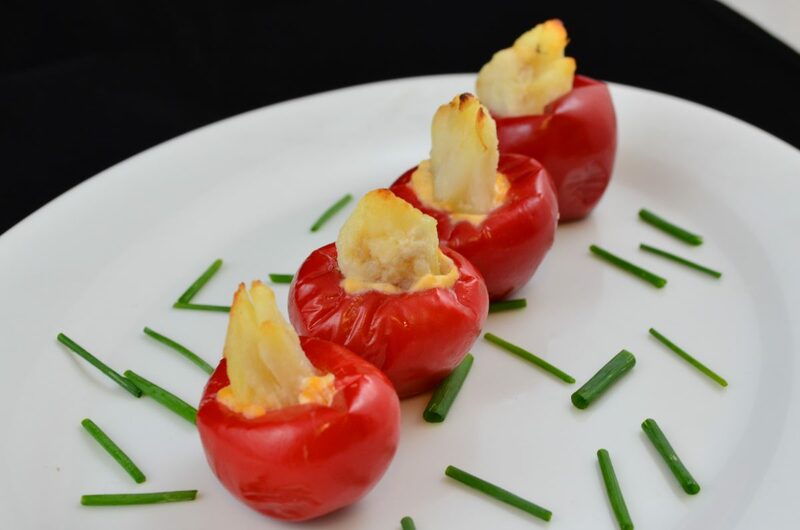 Sweet pickled peppers (like Peppadew brand) are stuffed with a creamy filling and topped with big beautiful pieces of our IQF Jumbo Lump Crab. They are sweet, tart, creamy, savory and just a little bit spicy. 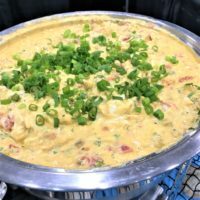 Perfect for a cocktail party or for watching the big game with a beer. I thought this name was funny as my wife is on business in Amsterdam this week. Actually when I think of cod, I think of when I worked in Fall River, Massachusetts the Portuguese capital of the US. I think cod, I think clams, chorizo, kale, garlic, potatoes, tomatoes, white wine, I think Fall River. Well I wanted to try something new and different. 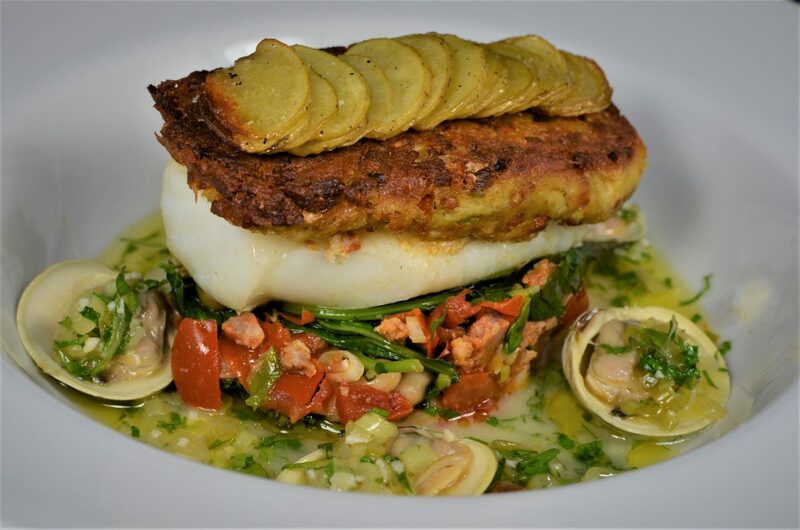 I love corned beef hash but I also love Caldo Verde, so why not a crab-chorizo hash as a crust on some cod, all the flavors of the classic Portuguese soup and some clams just because. The crust is simply finely shredded potato, crab, cooked chorizo and some egg to hold it together. Place on the fish and cooked until a crispy and crunchy crust forms and the fish is soft and flaky. Served over a sauté of roasted tomatoes, white beans, garlic and baby kale. Then there are the clams, steamed and served in a white wine broth around the fish. And then the fish is crowned with decorative potato rounds for extra crunch just becuase. Tilapia, it is seems to be on every menu. 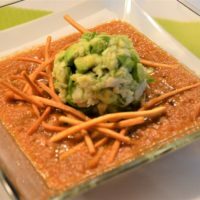 It is a very mild, easy to cook and affordable fish. Our 4oz fillets are extra nice, they are clean label, nothing added. As a chef, this makes huge difference as it cooks more naturally than treated product. Because of this I decided to do a somewhat unique “stuffed” tilapia. 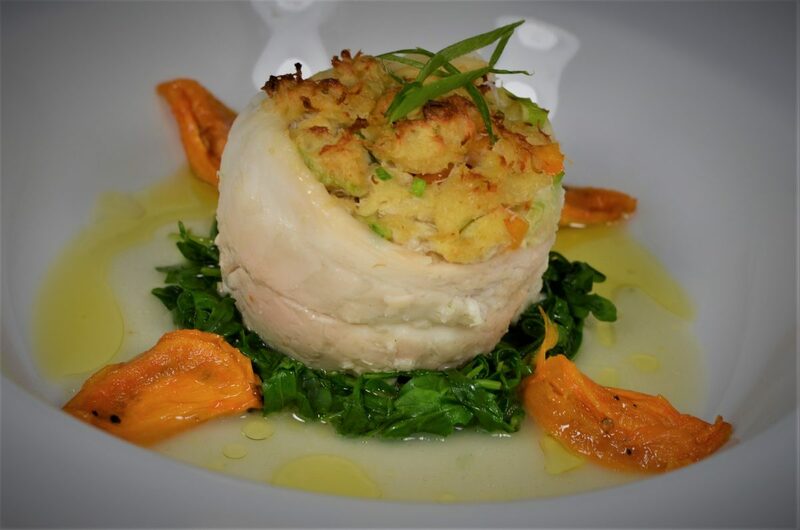 Place the tilapia fillet around the inside of a ring mold, fill with a classic Maryland style crab cake, drizzle with a little white wine and melted butter. They are roasted in the ring mold until the crab cake is golden brown and delicious and the fish is flaky, delicate and moist. Serve over wilted greens with slow roasted tomatoes and finish with a light white wine sauce and a drizzle of good EVOO. 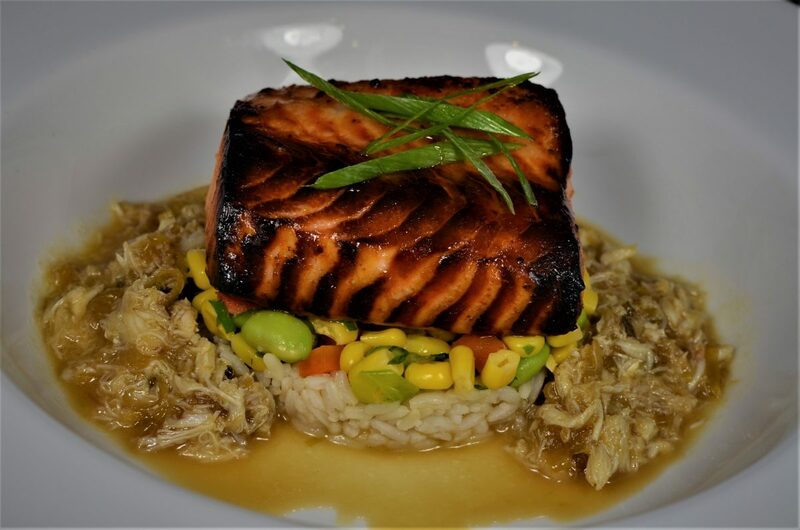 A classic marinade of white miso, mirin, sugar, ginger and garlic on our 4oz salmon. Broiled until it is zed with a deep caramelized crust. Served over a succotash with edamame, corns, bell pepper, onion and scallion. And finished with a sauce loaded with some of our Special crab meat, mirin, soy and butter. 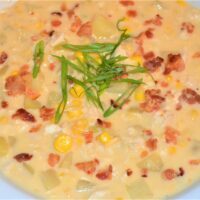 Recipes to follow. Some recipes are classic, Steak Oscar is on that list. 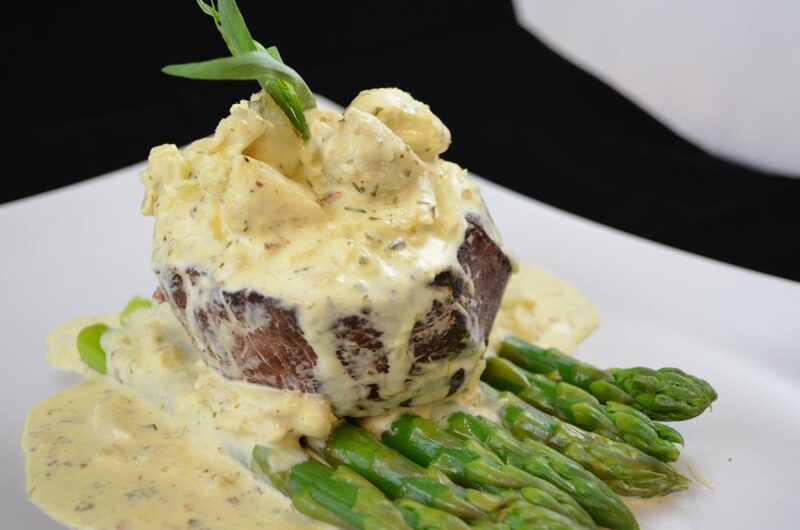 a perfectly seared steak over fresh asparagus and covered with a buttery Béarnaise sauce and jumbo lump crab. This is a classic, no doubt about it! 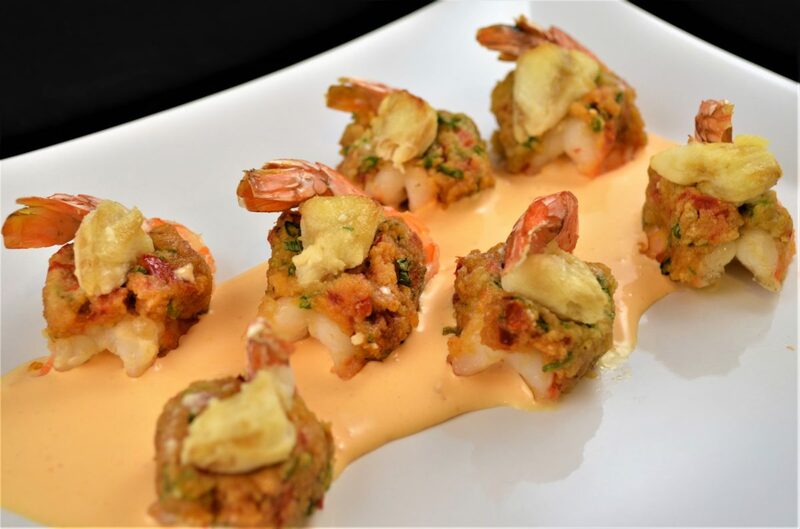 Do butterflied jumbo shrimp overflowing with a buttery crab stuffing sound good? 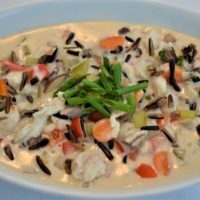 Well here is the recipe, along with a light roasted tomato cream sauce to take it to the next level of deliciousness. 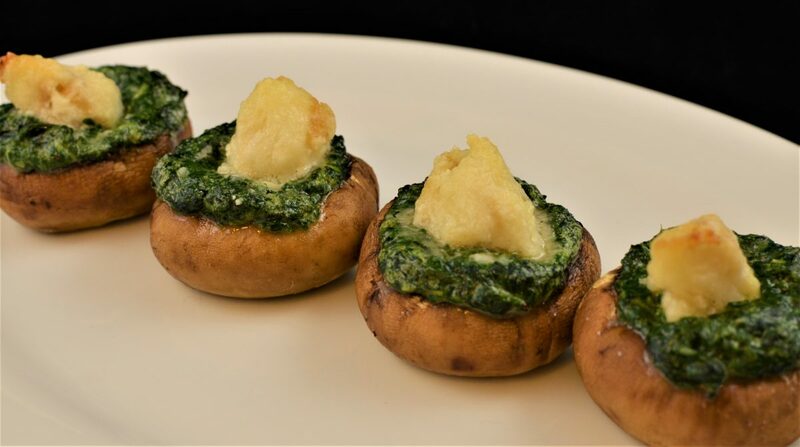 Big, juicy roasted mushrooms stuffed with creamy spinach and jumbo lump crab! 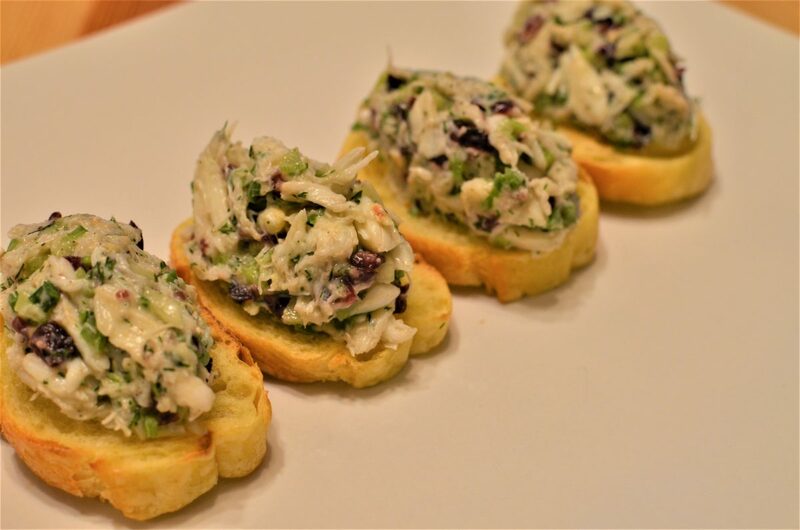 Perfect as an elegant hors d’oeuvre, an appetizer or even with a grilled piece of salmon or steak as a main course. .
Toasted baguette slices covered with a light, seasonal crab salad. A perfect recipe for an elegant cocktail party. Oversized handmade ravioli filled with crab, corn and creamy ricotta bathed in a zesty ginger butter sauce and toasted pine nuts. 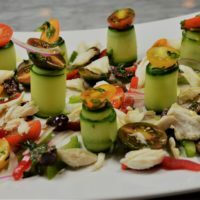 A beautiful appetizer or put a few on a plate and garnish with a little more crab for a signature main course. 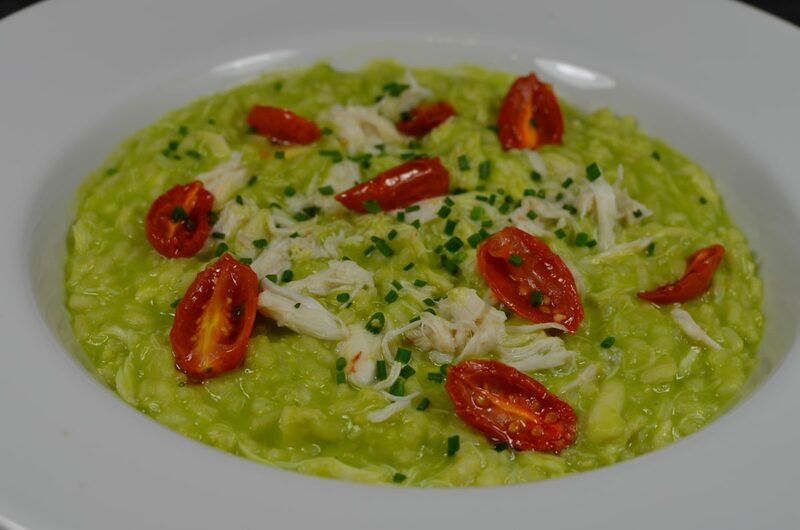 Taking my basic risotto recipe and finishing it with a smooth vibrant green puree of sweet peas, fresh crab meat and roasted tomatoes creates a delicious and visually stunning first course, entrée or even elegant side dish.